When people think about issues in their communities, they usually frame those issues through practical questions they would like to see addressed. Is the town budget too high or too low? Are teachers doing a good job? Are the streets safe? Do emergency responders have the right training? How can traffic congestion be eased? Does the library have the best technology for patrons? Do zoning rules work the best way? Are all the people in the community getting fair access to social services? Broadband users are sometimes less satisfied than others with community life . That raises the possibility that upgrades in a local information system might produce more critical, activist citizens. Social media like Facebook and Twitter are emerging as key parts of the civic landscape and mobile connectivity is beginning to affect people’s interactions with civic life . Some 32% of the internet users across the three communities get local news from social networking site; 19% from blogs; 7% from Twitter. And 32% post updates and local news on their social networking sites. Do the parts of the information system fit together? In their activities and attitudes, people show how the information system parts fit together. But some elements are difficult to assess independently: Community residents showed in their answers how they feel the system works and how the different elements of the system are connected. There were notable associations between some of the indicators and civic outcomes. For example: Those who are avid news consumers are more likely than others to be civically active. Broadband users and library patrons are more likely than others to feel good about their ability to gather information to meet their needs. Those who have found helpful government information online feel better than others about their own ability to make their communities better. Those who think their children are getting good computer- and information-evaluation training at school feel better than others about the overall performance of the schools and several other local institutions. More generally, there were correlations between citizens’ sense of how the information system as a whole was performing and their overall satisfaction with their community, their evaluation of existing stocks of information, and their belief in their own capacity to drive community change. Yet several of the indicators are difficult to measure and assess independently without complicated and expensive methodologies – notably, the quality of a community’s journalism, the effectiveness of technology programs at schools, the availability of “quality of life” information from community organizations, and the “effective opportunities” for citizens to have their voices heard. Yet several of the indicators are difficult to measure and assess independently without complicated and expensive methodologies – notably, the quality of a community’s journalism, the effectiveness of technology programs at schools, the availability of “quality of life” information from community organizations, and “effective opportunities” for citizens to have their voices heard. Moreover, many of the local leaders who attended community workshops for this research initiative argued there was another variable that mattered in understanding the effectiveness of local information systems. That variable related to the flow of information – to citizens’ capacities to search for, aggregate, process, and act on information that is relevant to their needs. The community leaders reported that it was often the case that their stakeholders were not aware of the most useful information in the community and not certain how to act effectively on the information they did have. They also noted there were times when local governments were not effectively communicating to residents what information was available. Those who think local government does well in sharing information are also more likely to be satisfied with other parts of civic life : Residents who said in the surveys that their local government was good at sharing information were more likely to feel satisfied with a host of other aspects of civic life. Citizens who believed that their government was forthcoming about its activities were more likely than others to feel better about these things: the overall quality of their community; the ability of the entire information environment of their community to give them the information that matters; the overall performance of their local government; and the performance of all manner of civic and journalistic institutions ranging from the fire department to the libraries to local newspaper and TV stations. In addition, government transparency is associated with residents’ feelings of efficacy and empowerment: Those who think their government shares information well are more likely to say that people like them can have an impact on government. It might be the case that signals from government that “we want to be open about what we do” make people think they can take advantage of that openness and influence the way the government operates. Despite the business troubles in the news industry, residents are pleased with the performance of local news organizations and feel they generally present diverse perspectives on community news. Many think they are getting more local information than they did five years ago. If they felt they were getting more material now, they were also more likely to be civically engaged: The news ecosystem in many communities, including in these three, has been in severe financial difficulty in recent years. Yet people in these towns rate local news operations quite favorably and those good opinions are very similar to the judgments residents offered in surveys commissioned by the Knight Foundation in 2002 before journalism’s business problems were acute. 50% say internet sites that focus on local affairs are doing an excellent or good job. Additionally, more than two-thirds of the respondents said the four main news platforms — television, newspapers, internet, and radio – presented diverse perspectives in their communities. 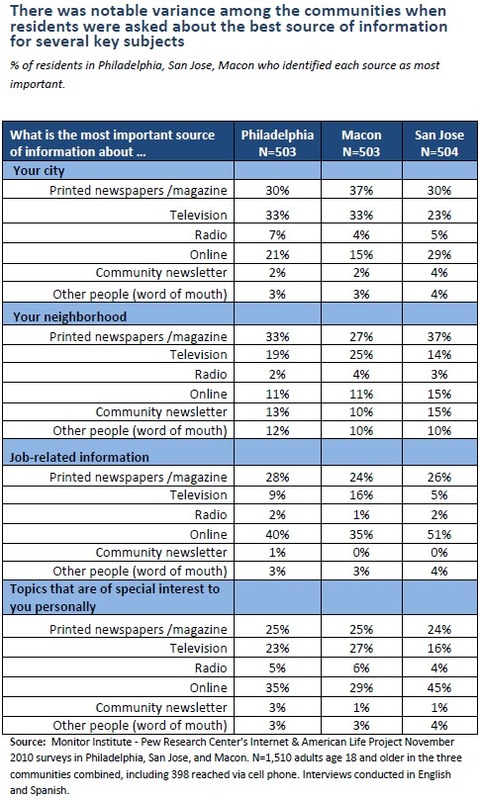 In spite of the dramatic staffing cutbacks at traditional news organizations and the economic stresses in newsrooms, only about a tenth of the people in these towns say they are getting less information about their communities than they got five years ago, while substantially more residents say they are getting more information (53% say that in San Jose; 44% in Philadelphia; 36% say that in Macon.) The rise of the internet as a local information source is a potential factor driving people’s sense that more local information is available to them. For instance, the internet is cited by citizens as one of the leading sources of information when they are seeking information about local jobs, topics that are of special personal interest. Still, while local residents sensed that they are receiving in aggregate more local information than before, we did not probe more specifically whether these perceptions hold true for specific areas of reporting and news coverage that other studies have suggested have been affected by disruptions in the journalism industry, such as local education coverage, government affairs coverage, and arts coverage. Those who said they were getting more local news and information were more likely than others to report they are very satisfied with the community, participate in some civic activities such as attending meetings and signing petitions, feel like people like them can have a big impact on the community, salute the performance of local institutions, and use the internet to gather information about local government. Citizen interest in news has long been found to be associated with civic engagement. That holds true in these communities. If people are news junkies who regularly use multiple news sources such as the newspaper, TV stations, and the internet, they are more likely to be civically active in several ways, including: attending meetings, working with fellow citizens to solve community problems, and interacting with news organizations. Of course, the relationship likely goes in the other direction, too. The civically engaged will naturally seek out more information because they will need the information to pursue whatever they are pursuing. Broadband users are sometimes less satisfied than others with community life. That raises the possibility that upgrades in a local information system might produce more critical, activist citizens: Perhaps the most surprising finding in the surveys was that in some circumstances, broadband users are more likely to be critical of elements of their local information ecosystem and less likely to feel that the local information system could produce information they might need. In these communities, San Jose distances itself from the other communities in online connectivity, with 85% of its adults using the internet and 76% of San Jose residents having a broadband connection at home. That compares with 66% of adults in Philadelphia who use the internet and 57% who have broadband connections at home; and 64% in Macon who use the internet and 50% who have broadband at home. The most recent data from the Pew Internet Project is that 79% of American adults use the internet and 67% of all Americans have broadband connections at home. At the same time, broadband connectivity does seem to have a clear civic payoff in at least one way for communities: Those with home broadband are significantly more likely to use the internet for civic activities, such as using email and social media to talk about local issues. 69% of the internet users in the three communities said that internet had made a major impact on their ability to learn new things. 48% of the internet users in the three communities said that internet had made a major impact on their ability to manage their health or the health of other members of their family. 34% of the internet users in the three communities said that internet had made a major impact on their ability to participate in their community. 24% of the internet users in the three communities said that internet had made a major impact on their ability to interact with government officials and politicians. Finally, a majority residents in the three communities agreed with the Knight Commission that having easy access to broadband was very important or pretty important: 78% of those in San Jose believe that; 67% of those in Macon believe that; and 63% of Philadelphians believe that. Interestingly, the people who already have broadband are much more likely than others to say access to it is important. Non-broadband users do not feel the same urgency to access as those who already have it. In the three communities combined, 32% of the internet users get local news from social networking sites like Facebook, MySpace or LinkedIn. In the three locales, 19% of the internet users get local news from blogs that focus on local subjects. In the three locales, 19% of the internet users get local news from an email listserv or group email list that focuses on local matters. In the three locales, 12% of the internet users use their cell phones to get local news either from websites or alerts that are sent to their phones. In the three locales, 7% of the internet users get local news from Twitter. In the three locales, 32% of the internet users have posted updates and local news on a social networking site like Facebook or MySpace. In the three communities combined, 17% of internet users have commented on issues on a local news website. In the three communities combined, 14% of internet users discussed local issues and news on email listservs. In the three communities combined, 12% of internet users had written on blogs about local subjects. In the three communities combined, 6% of the internet users had posted material on Twitter. People use different sources for different types of local information: The news and information ecosystem is fracturing. When it comes to the most important sources of information for people on particular subjects, there is considerable variance among the communities and among the topics about which people were questioned. In broad strokes, newspapers and television were deemed the most important sources for general information about the communities and residents’ neighborhoods, and the internet was the third most important source. But when it came to personally-relevant information such as looking for jobs or finding material about topics that were especially important, the internet shot to the top of the list of sources. Do citizens feel they can make a difference? Leaders in each community who participated in workshops related to the research expressed differing perspectives on whether their communities provided effective opportunities for citizens to have their voices heard. In Macon there were leaders of several traditional groups with national charters such as the Lions Club and Junior League. Many of the local leaders expressed frustration, saying that many local civic groups served only one portion of the community and that the government was not active enough in providing opportunities to discuss community-wide matters. In San Jose and Philadelphia, on the other hand, there was a somewhat more diverse mixture of groups. Local leaders in these communities said they thought there were sufficient opportunities to share their opinions, with each other and with the government. Still, they also expressed concern that these opportunities came only in segregated geographic or demographic communities. In these workshops, local leaders said they wanted to create opportunities for citizens to collaborate across geographic and topical boundaries and collectively develop and share their opinions about local issues. 57% of these residents say they have been to the local library in the past 12 months, yet fully 83% of residents (including many non-patrons) say they think the local library has the resources they might need to do research that is important to them. An even greater proportion of residents – 88% – say they think the local library has the necessary computers and internet connections they might require if an information-hunt were necessary. 34% of residents say they have had interactions with emergency personnel or police or fire fighters in the past 12 months, yet 86% say the fire department is doing an excellent or good job and 64% say the police department is doing an excellent or good job. 40% of residents have had interactions with teachers or administrators at local schools and 34% of the residents say they have attended a meeting on local or school affairs, yet 47% say they think the local schools are doing an excellent or good job and fully 76% say they believe the schools have classes or programs to teach students about how to get good, accurate information. Local community residents employ a range of strategies to find civic information: the three most common approaches are to use Google, to search local websites, and to tap their informal networks. In each of the communities, some residents participated in a “scavenger hunt” for local civic information. They were asked to show their search strategies for such things as: accessing local government services and discovering the budget for local schools. Participants in all three communities commonly used Google to search and find this information. They also frequently used the websites of the prominent local news organizations, such as the city newspaper or television station. The consistency with which these researchers targeted local internet sources in each community was interesting, and suggests a collective understanding of the best online sources. For example, in Philadelphia most of the residents that participated used Philly.com (the website of the Philadelphia Inquirer), and in Macon they used 13maz.com (local television station) and Macon.com (website for the Macon Telegraph). Finally, in each community the participants resorted at times to querying informal networks when they knew someone who worked in a relevant position. For example, many participants contacted someone they knew who worked in the school administration to find the budget for schools in their area. Each of these communities has a web portal for government and civic information, yet only a little more than a third of their residents were fully aware of that. Moreover, in the opinion surveys, we found that many who tried to use the internet to get local civic information could not always find what they were seeking. Only a quarter of these residents said that when they did searches for local civic information they always found what they were seeking. Yet even when they found what they were seeking, only 37% said the information presented to them was very clear and easy to understand. San Jose stands apart: As communities try to understand what thriving information systems look like and what kinds of benefits they produce, our first examination of these communities shows that San Jose might provide particularly interesting evidence. The town stands apart in several ways among the three communities. San Jose residents expressed the highest level of overall satisfaction with their town. They are the most wired. They are the most likely to connect to the internet by cell phone. They are the most praising of their local institutions, including fire, police, schools, city government, libraries, local cultural organizations, and local nonprofits that help the poor. Further, they are more content with their government’s willingness to share information. They give higher grades to the local newspaper. They are heavier patrons of libraries. They are more aware of the local government’s web operations. They are more likely to say that the internet is a preferred source of information on local topics and more likely to say the internet presents a diverse range of points of view. And they are more likely to say they are getting more information now compared with five years ago. Some of these differences are likely to be rooted in economic and socio-economic differences among the communities. The San Jose survey sample showed that compared with the other two communities people in San Jose had higher household incomes, were more likely to have full-time jobs, and more likely to have college or graduate degrees. Some of the advantages residents feel about their information system could stem from that relative affluence and the economic vitality in the community. Still, there are suggestions in these findings that a more robust information system brings its own rewards in citizen satisfaction and the performance of the organs of civic culture. These findings are not so clear or strong that they can end discussions about what elements of the information ecosystem are most critical or how the parts of the system work with each other. More findings in other communities, perhaps employing other methodologies, could help bring these important issues more clearly into focus. This research and the input Monitor got in workshops with leaders in each of the cities could be taken as heartening news by other communities that want to explore their own information ecology and the way citizens operate in it. We did not establish causality here – for instance, that greater government transparency provides benefits to a host of civic organizations or that broadband-adoption initiatives will heighten citizens’ critical thinking about their community or that higher-quality journalism will encourage more people to turn out for town meetings. Yet these possibilities emerge in the answers citizens and their leaders gave. We learned that conversations about a locality’s information needs can bring striking vitality to the ways people think about how to make their community’s better.